Sometimes the writing is on the wall. In this case, it’s been there for a while. New York Giants quarterback Eli Manning told reporters Monday that he expects the team to select his replacement in the upcoming NFL draft. The Giants have struggled for years with Manning behind center, posting one winning record in the last six seasons. The 5-11 and 3-13 campaigns of the last two seasons have been abysmal. 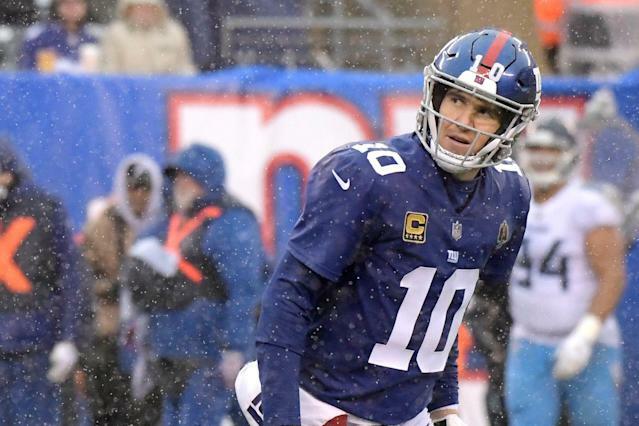 While the Giants have stood by their 38-year-old quarterback with two Super Bowl rings, they have faced criticism from many for failing to recognize when it was to move on. After they passed on selecting a signal-caller with the No. 2 pick in last year’s quarterback-rich draft class for running back Saquon Barkley, Manning sounds convinced that the Giants are finally ready to look to the future with the No. 6 and No. 17 picks of next Thursday’s draft. Giants co-owner John Mara told reporters at the owners meetings in March that he’s open to selecting Manning’s successor, but sounded far from committing to making it a priority. “I think that would be a great scenario if it happened, but I don’t want us to force a situation where if the value for the quarterbacks this year is not there, then don’t take one,” Mara said. “If it’s there, yeah, take one, it’d be a great situation to have somebody in place to sit behind Eli for some period of time, see how he prepares for each game, see what a professional he is. A young quarterback can only get better doing that. Draft or trade for a QB? Selecting a quarterback in the first round would likely mean trading up for Oklahoma’s Heisman Trophy winner Kyler Murray or taking Ohio State’s Dwayne Haskins, Duke’s Daniel Jones or Missouri’s Drew Lock later in the first round. Other potential options could be to seek a deal with the Arizona Cardinals for Josh Rosen if they intend to use the first pick of the draft themselves on Murray. A much longer but more enticing shot could be to make a move for disgruntled Seattle Seahawks quarterback Russell Wilson, who is reportedly walking away from contract talks after not reaching a deal on an extension by his self-imposed April 15 deadline. Are Giants finally ready to make QB move? With Manning entering the final year of a four-year deal and the Giants having made moves to improve their draft positioning — including obtaining the No. 17 pick from the Cleveland Browns in the Odell Beckham deal — things appear lined up for the Giants to finally turn to the future. Of course a similar statement could have been made this time last year. Instead of selecting a young quarterback to build for a future with Beckham, the Giants took Barkley and eventually shipped their transcendent young receiver to the Browns. So trying to predict what the Giants do — especially at this height of misinformation ahead of the NFL draft — truly amounts to guesswork.